VISAKHAPATNAM: They fly thousands of kilometres just to find a suitable ecosystem to feed, breed and nest. The inference is about the migratory birds that fly across continents and countries to escape the harsh seasonal weather in the native land and again fly back after a brief sojourn in a more temperate and tropical land. This has been feature of almost all the 350 odd species of migratory birds. But thanks to human interference, many of them are on the verge of becoming extinct. As per a survey by the UNEP, there are only about 190 great white cranes left in the world. The Director of Academic Staff College and former HoD of Department of Zoology, Andhra University, Bharat Lakshmi says, “Human interference in the form of urbanisation, industrialisation, deforestation, mining and pollution has affected the natural routine of these rare migratory birds. These birds are very sensitive to human interference and pollution and once they notice the change they do not return to the nesting place and succumb to the harsh climate in their native land. Keeping this issue in mind the Convention on Migratory Species and African Eurasian Migratory Water Bird Agreement in association with UNEP have declared May 14 as World Migratory Bird Day and it has been in practice since 2006.” This year’s theme is “Land use changes from a bird’s-eye view” and UNEP’s idea is to raise awareness on the effects human land use has on migratory birds and the ecosystems upon which they depend. Coming to the degradation of local ecosystems, the professor points out that Kondakarla Ava, Gosthani Estuary and Thatipudi are homes for such migratory birds since time immemorial. While Kondakarla is visited by a variety of migratory ducks and whistling teels, Gosthani is frequented by species such as plovers, dunlins, sandpipers and curlews. “The population of these rare species have been diminishing over the years. It has now reduced to almost 50 per cent then what it was about 15 years ago. White pelicans and pink-headed ducks were once visitors at Kondakarla, but now they have become almost extinct. The same is the case with Kolleru Lake and Naupada swamp. Kolleru Lake was regarded as the largest pelicanery in India, and today it has lost all its natural splendour due to human interference. 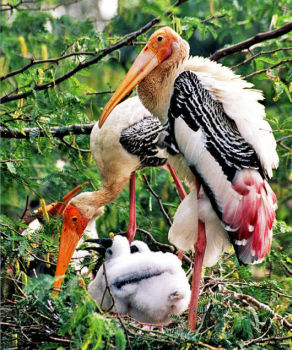 In the Naupada swamp, especially Teelineelapuram village is visited by the world famous spot-billed pelicans and painted storks, but if the authorities continue with the proposed thermal plants, the birds will not come here anymore and would succumb to the harsh winter in Siberia,” says the professor. To create awareness, Bharat Lakshmi organised a one-day photo exhibition and lecture session on migratory birds at the Academic Staff College on Saturday.